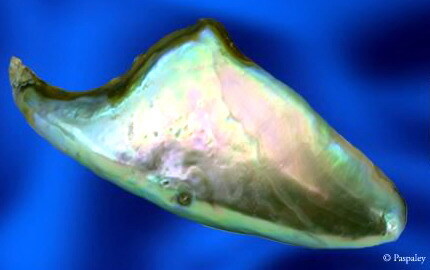 The 187.50-carat, horn-shaped (baroque), natural, abalone pearl derives its name from its one time owner, the internationally renowned jewelry designer and dealer, Christopher Walling, whose creations had adorned celebrities and notables in society such as Elizabeth Taylor, Kathleen Turner, Queen Noor of Jordan, Danielle Steele and others. It is said that a pearl in the National Museum of Natural History, Smithsonian Institution, Washington D.C. has been named after him. It thus appears that the pearl that has been so named by the Smithsonian Institution, is none other the 187.50-carat horn-shaped Christopher Walling Abalone Pearl, which was exhibited by the Smithsonian Institution, at the "Allure of Pearls" exhibition, together with eleven other rarest pearls in the world, held from March 18 to September 5, 2005, and was co-sponsored by the GIA, Paspaley Pearls Pty Ltd. and Iridesse Pearls. The NMNH of the Smithsonian Institution has a tradition of naming exhibits such as gemstones and jewelry after their owners, when such exhibits were given as gifts or bequeathed to the Institution by their owners. Thus, in all probability the Christopher Walling Abalone Pearl, would have been given as a gift to the Smithsonian Institution, by the famous designer and pearl enthusiast. The rare horn-shaped abalone pearl has dimensions of 84 X 40 mm and a weight of 37.50 grams equivalent to 187.50 carats or 750.00 grains. The color of the abalone is a potpourri of green, blue, orange, pink and silver colors, with their characteristic intense iridescence and luster. The horn-shape of the pearl is the common irregular baroque shape in which most abalone pearls usually occur, and is a reflection of their origin from the gonads of the univalved mollusk, which also has a horn shape. Abalone pearls have an alveolar structure, that appears to be radiating from the center, giving rise to unusual surface sheens or patterns. Abalone pearls are not only the most beautiful pearls in the world but also the most rarest. Statistical estimations of their natural occurrence in significant sizes, greater than 15 mm in size, is said to be one in 1.5 million, for all species of abalones. The principal reason adduced for their rarity is the premature harvesting of the abalones for their meat in 4 to 5 years time, long before the pearls have had a chance to attain their maximum size, which is around 8 to 10 years. The color, brilliance and iridescence of abalone pearls are the most striking features that sets them apart from all other natural pearls, and perhaps marveled ancient man, that abalone shells and pearls became the first ornaments worn by man. Such bright colors are associated with the thick layers of nacre, that constitute the shell and pearls of abalone. The nacre of abalone is made up of microscopic calcium carbonate tiles (aragonite and calcite) stacked like bricks and separated by sheets of organic matrix composed of the protein conchiolin, and elastic bipolymers such as chitin and lustrin. When an ablone shell is struck, the tiles slide against one another, instead of shattering, and the protein matrix stretches to absorb the energy of the blow. This accounts for the exceptional strength of abalone shells. The thickness of the microscopic aragonite tiles is comparable to the wavelength of visible light. This causes the constructive and destructive interference of different wavelengths of visible light falling on the nacre, causing different colors of light to be reflected at different viewing angles, producing the iridescent effect. 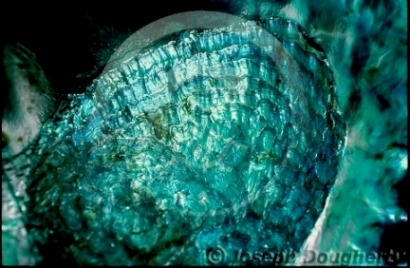 Iridescence and orient of a pearl are actually properties caused by the interference of light, and may to some extent contribute towards the multi-hued tones of the abalone nacre. But, the body color of a pearl (or shell) which represents the hue, intensity and saturation of a pearl's color, are actually caused by true pigments or biochromes. Some of the pigments that can cause colors of mollusk shells are the green porphyrins including chlorophyll pigments, yellow carotenoids, black melanins, blue and red indigoids, red phycoerythrin and blue phycocyanin pigments found in red, brown and other algae consumed by mollusks such as abalones. Pigments secreted by special glandular cells in the mantle, bonds with the protein component of the shell, the conchiolin. When the conchiolin is free of any bonded pigments, it becomes transparent and shows the color of the aragonite (calcium carbonate) which is white or cream colored. 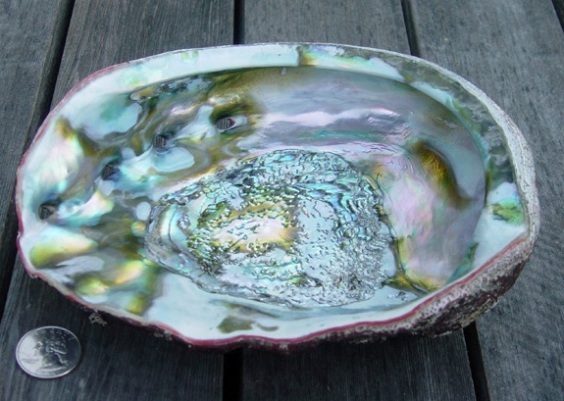 The multihued tones of color found in abalone shells and pearls consists of silver, green, orange, pink, blue and lavendar (bluish-purple). In some abalone shells only a single color predominates, but in most cases the shells reveal several of these colors simultaneously, in every conceivable combination. The "Christopher Walling Abalone Pearl" also comes under this category of multi-hued abalone pearls. The most common and the largest of the seven species is the red abalone Haliotis rufescens. These abalones are found in the inter-tidal and sub-tidal zones, clinging to rocks along the shore down to depths of 65 meters (200 feet) or more. In these rocky habitats the abalones are associated with underwater kelp forests, that serve as the source of food for the mollusks. Some of the native abalone species occupy the same coastal regions, but may be separated by depth or latitude. Three species of abalone, red, black and pinto, occur along the entire length of the California coast. Three other species, pink, green and white occur in southern California and Mexico. 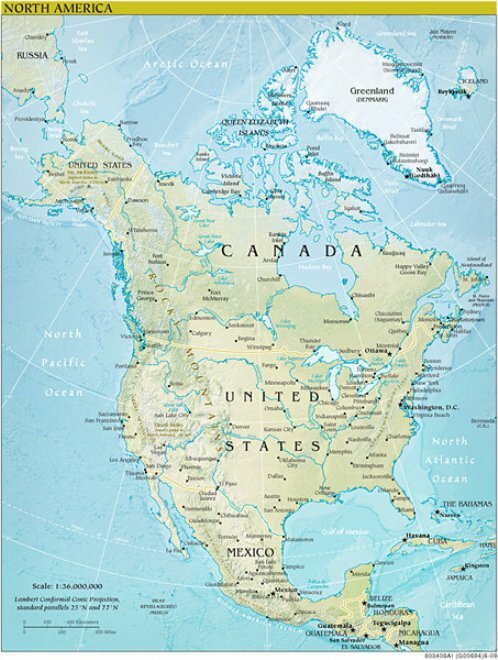 Flat abalone occur from central California northwards up to British Columbia in Canada. The range and depth distributions of the eight species are given in the table below. Some of the external and internal structural characteristics that can be used to identify the different abalone species found in California, are summarized in the table below. Out of the eight species of abalones, five species, red, pink, black, green and white were exploited commercially and as recreation, mainly for their meat, which was considered a delicacy and was greatly in demand. Over exploitation of abalone populations, combined with other factors such as "withering disease," long term warming trends coupled with enhanced storm activity, reduced kelp abundance, increased competition with sea urchins, natural predation from sea otters, loss of habitat caused by coastal development and pollution, have resulted in a drastic reduction in abalone populations belonging to all species, and one species the white abalone, has been listed as endangered under the general Endangered Species Act (ESA), and another, the black abalone, is a prospective species for such listing. 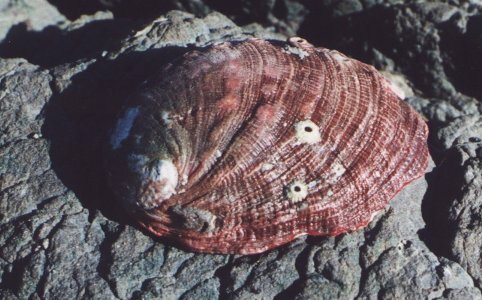 Thus abalone populations have been decreasing rapidly over the past 40 years, resulting in restrictions being placed on the exploitation of different species, and by 1993, harvesting of all abalone species had been stopped except red abalones. By 1997, dwindling red abalone populations led to a total ban on the exploitation of all abalones, and only a recreational red abalone fishing program is now in place, only in northern California, with tight restrictions being placed on the number of abalones that can be taken on a single day, for the entire year, as well as the size of abalones that can be legally taken. Did the Christopher Walling Abalone Pearl originate in the red abalone Haliotis rufescens? A study of the colors of the inner surface of the shell of the eight species of abalones, might give a possible indication as to the species from which the "Christopher Walling Abalone Pearl" originated. According to the table of structural characteristics given above, only two abalone species have the bluish-green interior, the predominant colors in the multihued "Christopher Walling Abalone Pearl." Thus the possible origin of the abalone pearl, is either the red abalone, Haliotis rufescens or the green abalone, Haliotis fulgens. Green abalones supported an important fishery in California in the 1960s, with landings peaking in 1971, and rapidly declining thereafter. Green abalone commercial and sport fisheries had been closed since early 1990s. However, red abalone commercial fisheries continued up to 1997, in northern California, and is still continued as a recreational fishery to this day. Thus in all probability the multihued "Christopher Walling Abalone Pearl" originated in the red abalone, Haliotis rufescens. Christopher Walling - Proprietor Christopher Walling Inc.
Christopher Walling, who is said to have descended from a notable line of creatively oriented activists and philanthropists, is a world renowned jewelry designer, described by Sotheby's as "undoubtedly one of the most exciting jewelry designers on the scene today." He never attended art school, yet he became one of the most talented jewelry designers of today. It is said that he started working as a jeweler when he was only eight years old. Thus he is a designer who had dedicated a lifetime towards his chosen profession, and excelled in his field creating stunning designs that have significantly influenced the designing of modern jewelry. He is well known for the incorporation of unusually shaped baroque pearls in his creative designs, reminiscent of the jewelry designs of the 16th and 17th century that made use of such pearls, such as the famous swan pendant, preserved in the State Hermitage Museum, at St. Petersburg. Besides pearls, he also uses diamonds and a variety of other colored gemstones in his unique creations, such as flower brooches, necklaces, bracelets, earrings etc. Christopher Walling's jewelry creations have been exhibited in museums across the United States including Hawaii, and also on two occasions in museums in Istanbul. 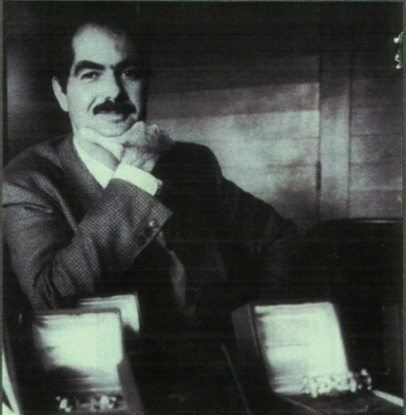 He has eleven publications on contemporary jewels to his credit, and his work had been prominently featured in two PBS documentaries, "Mystique of the Pearl," and the "Nature Special Diamonds." In the world's traveling PEARLS show, belonging to the American Museum of Natural History, Christopher Walling has always had at least two of his jewelry pieces on display at all times for the past six years. Christopher Walling started his first jewelry store, called Christopher Walling Jewelers, at No. 325, East Hopkins Avenue, Aspen, Colorado. Subsequently, he started his New York store, known as Christopher Walling Inc. at 608, Fifth Avenue, New York City.